Steampunk is the name given to a new and modern reinterpretation of Victorian clothing. Essentially, Victorian clothing elements (such as lace, corsets, bustles and flounces) are combined with industrial themes (such as metal, leather, and dark colours) to create a very modern and often burlesque look. A steampunk skirt sold by Retroscope Fashions. I – rather suddenly – decided to go to a steampunk event with some friends and needed a rather quick and easy costume for it. My idea was that I could draft a pattern of a relatively simple Victorian skirt and use some of the steam punk ideas to dress it up. I looked at several skirts on the internet and came up with a look I was happy with. Now, before sharing this quick little project, I must say that I have never made a steampunk outfit before. I also don’t really like black or brown and revealing or skimpy clothing are not really my cup of tea (probably because I am not that young and slim anymore!). So this little steampunk adventure doesn’t really feel “punky” enough to deserve the name! However, I felt that it was still worth sharing. 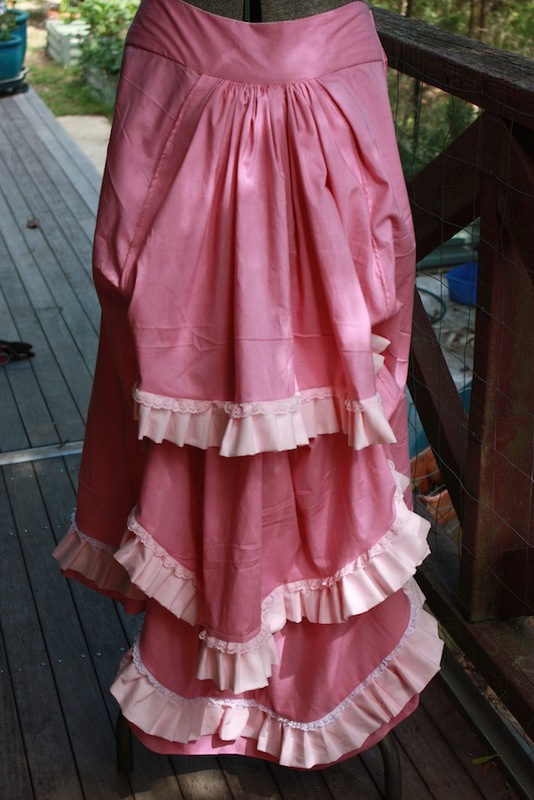 After looking at several skirts online, I decided that I could use a similar pattern as my Victorian petticoat, with all the ruffles at the back. 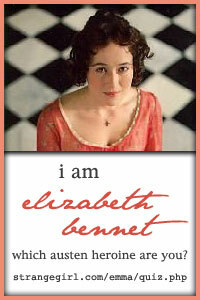 I also wanted the front cut shorter at the knees, and I wanted some draping to imitate a bustle at the back. I really liked the wider waistband (more like a yoke) that lots of steampunk skirts have, with the addition of possible lacing to imitate a corset. This is the pattern layout that I began with. Remember to add any seam allowances. This is the pattern layout for the skirt. The dotted lines across the back panel indicate the cutting line for the “bustle” pieces. This means that this back piece will need to be cut three times, each on a fold line (once for the skirt back, once for the short “bustle” piece, and once for the long “bustle” piece). I have used some notch marks to indicate how the skirt panels are pieced together. The fold line on the front panel is the centre front and the fold line on the back panel is the centre back. The skirt part is quite easy to fit to any figure. The curve line at the top of each of the skirt panels needs to measure about 1/5th of your total waist circumference. You can make the “waist curve” in back skirt panel a little longer than this if you like, which will give the back panel more gathers. You can make the skirt length whatever you like. I have made mine to scoop up at the front. The yoke, however, will take a bit more fitting. Maybe you have a pattern you could use with a yoke that already fits you. Otherwise you can use some scrap material to make a toile or mock-up, which can be fitted to your body and then unpicked to use for your pattern. Or you could “drape” your yoke, which is what I did. To do this, set your dressmakers form to your measurements and then pin some fabric to the centre front waist, making sure the grain line is vertical. Smooth the fabric around to the sides of the dummy. In order to make the fabric sit correctly, you will end up with a curve at the top of your yoke and a diagonal seam at the sides. Do the same with the back. Cut or pin your yoke to fit, then sew it together and try it on to double-check. My back and front yoke ended up being different sizes, but they could be the same. Semptress also has a great tutorial to make your own yoke pattern too. Unfortunately, I didn’t take as many pictures as I usually do, so my construction steps are a little sparse with diagrams! 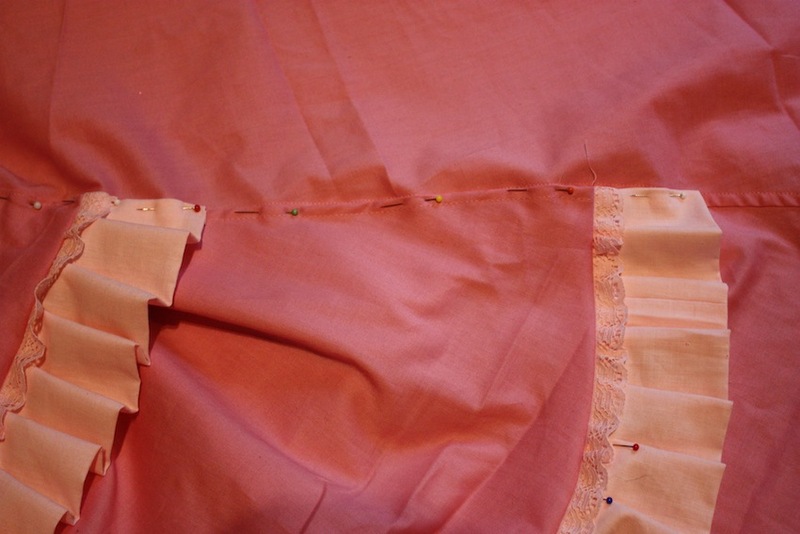 Step 1: Firstly, take the two back “bustle” pieces and sew the ruffles and lace along the bottom edge. These two “bustle” pieces are then gathered separately and laid on top of the back panel, which has also been gathered separately. Pin all layers together along the waistline. It makes sense at this point to pin the side seams of all the layers together. This will mean that the raw edges of the bustle pieces will be hidden in the seams of the skirt. I forgot to do this and instead I did Step 2 first and then I had to topstitch the “bustle” pieces to the skirt. 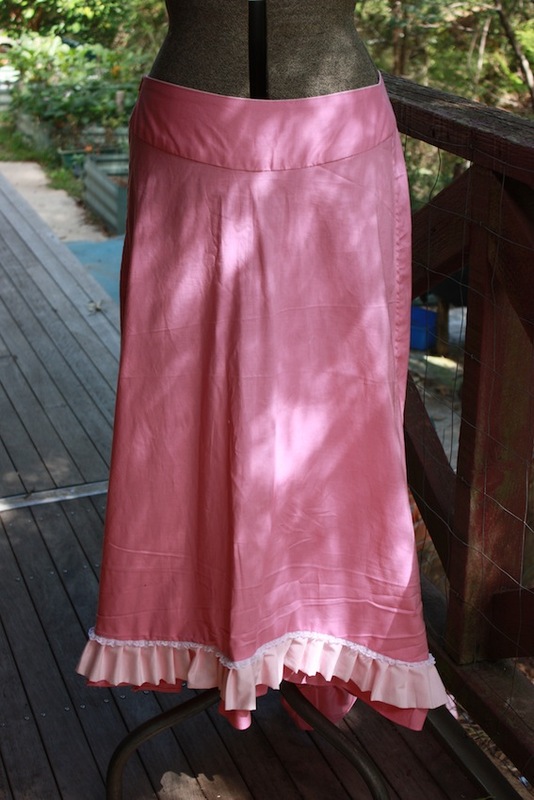 The two “bustle” pieces have been hemmed at the side seams and then laid on top of the skirt. A top-stitch through all layers attaches the pieces. This is not the neatest way to do it unfortunately! Step 2: Sew all the skirt panels together, flat-felling the seams. Step 3: Sew the front and back yoke pieces together. Sew the front and back yoke lining pieces together. 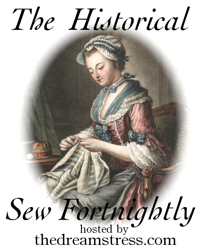 With right sides together, sew the yoke and the lining together along the top curved edge. Clip curves and turn to the right side. Step 4: Attach the skirt to the bottom curved edge of the yoke. Make sure the front side seam is sitting at the yoke side seam so that a zip can be easily inserted. 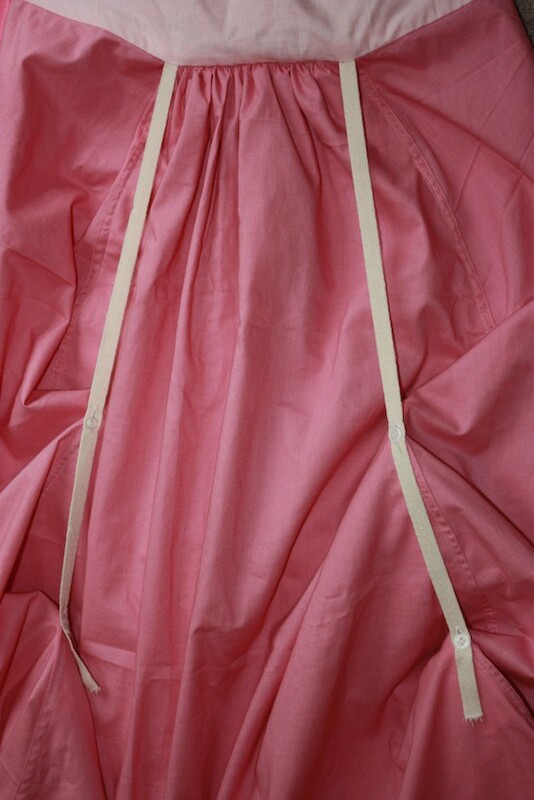 Adjust the gathers of the back panel and “bustle” pieces to fit. These will probably be fairly tightly gathered! 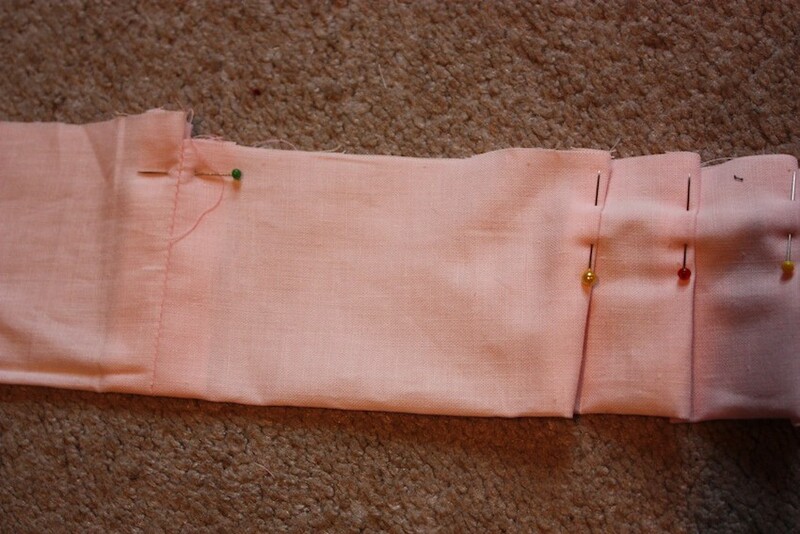 Step 5: Sew the zip into the side seam of the yoke and into the top of the front side seam. Then handstitch the yoke lining down, folding under any raw edges. Not precision work, but a zip none-the-less! Step 6: Sew the ruffle and lace along the bottom edge of the skirt. My ruffles were folded lengthwise (so the ruffle did not have to be hemmed) and then pleated. The ruffle is cut on the straight grain and folded lengthwise. Any joins are made with a seam. The entire ruffle is pleated. Step 7: Attach two lengths of cotton tape or twill tape to the inside of the yoke, where the two back side seams of the skirt meet the yoke. 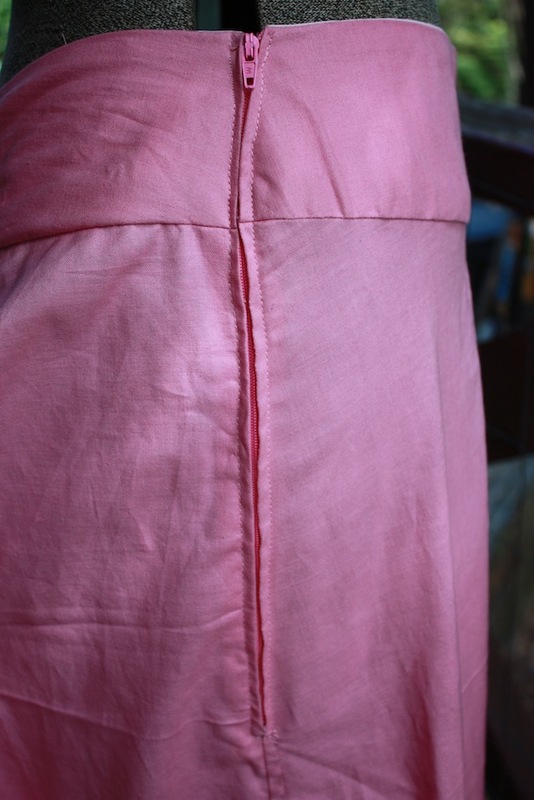 Attach a button to each point where the bottom of the “bustle” pieces meets this seam; a total of four buttons. Sew buttonholes in the tape so that the skirt can be drawn up and buttoned. You can add more buttonholes to the tape so that you have more options for draping. The inside of the skirt, at the back. You can see the two lengths of twill tape which is buttoned to four buttons. I really wanted to add a lacing panel to the yoke somewhere, mainly because this dress will be leant to friends and it would provide a way to draw in any fullness (as well as being a bit decorative). I also wanted to have a drawstring casing or some sort of clip system to the front panel (on each of the front side seams) so that the front of the dress could be drawn up over the knees. These can always be added later. For now it is all finished! Stay tuned for my new steampunk blouse! Hmmm, accessories! I will have to think about that! Yes, it is pretty easy with good effect, I felt. Not the best sewing job I have ever done, but fine for a fun picnic! Very nice. I’m not slim and close to 60, but I enjoy the combination of historical clothing and sci-fi fun. I mainly got involved because I often drive my adult daughter, son, and friends to out of town events. This is very helpful. I’m doing steampunk for Halloween and I’ve been just winging the pattern on my own. Trying to model it off the black skirt you have at the top of this blog. 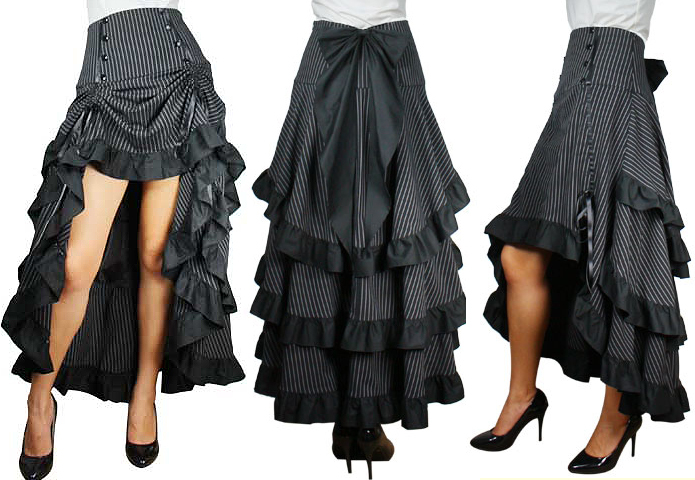 It came up when I googled steam punk skirt. Ive got 90% of what you did already cut and working on making my ruffles. I’m going to add a few of your steps to what I have going, I just wanted to thank you. And say that I wish I had actually clicked on the link of the pic sooner and not just stared at it to make my own pattern. Thank you , this is awesome. I love your skirt! Yes, it can be quite difficult to “wing” a pattern! A bit of trial and error involved, so I hope you find my trial and error helpful. I hope you have a lovely outing in your new skirt! About how much fabric did this take? I’m looking to make one and if like to low how much fabric I need. It depends a bit on how tall you are, or how long you want it, how full you want the skirts, and also how many bustle-y bits you have at the back. It also depends on how wide your fabric is. I think I had between 3 and 4 metres of fabric (115cm wide).